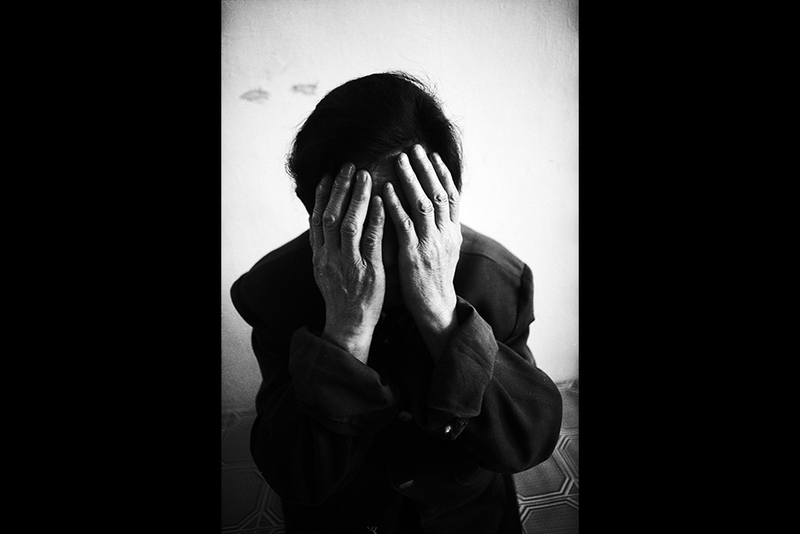 An elderly woman refugee from North Korea hides in a house in Northern China, 2008. She said she left North Korea a year earlier because she didn't “want to wait to die.” The lack of food is a major reason North Koreans cross the border to China. According to an activist, many North Koreans initially have no plan to leave for good. 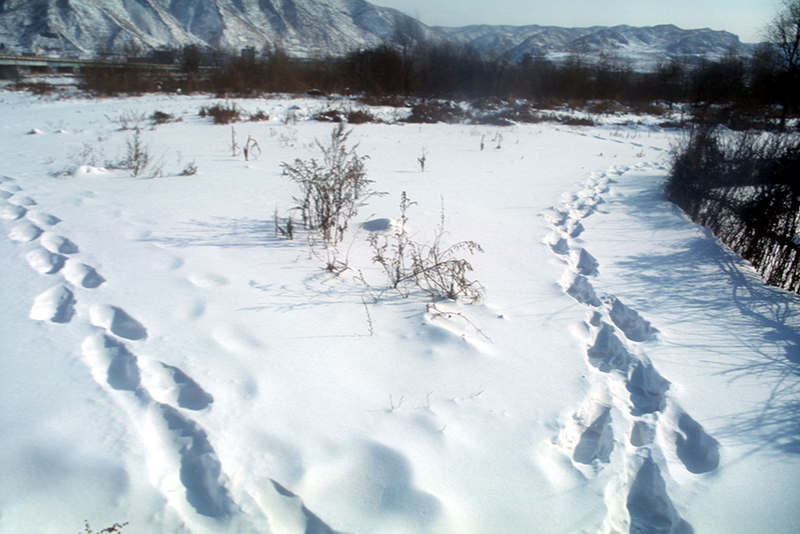 Footprints in the snow lead to the border between China and North Korea, January 2004. 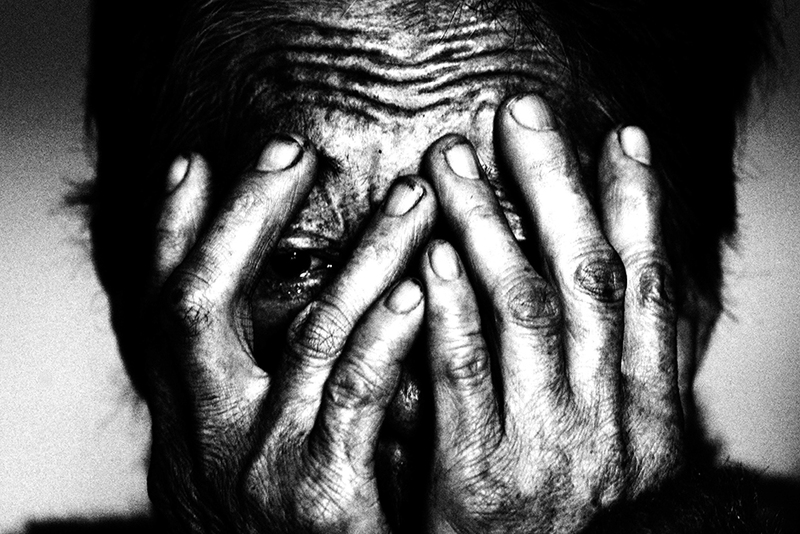 Defectors live in constant fear of being discovered. An elderly woman who crossed the border from North Korea into China, 2006. 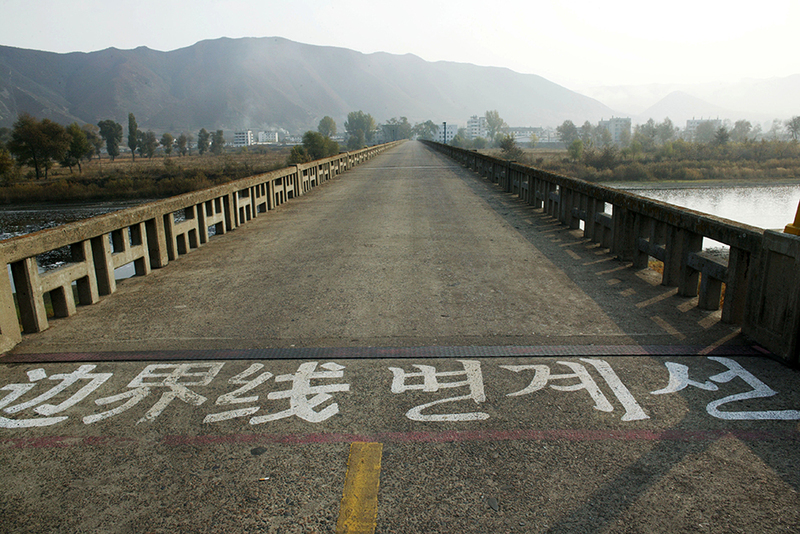 The yellow traffic-line paint stops mid-bridge at the official demarcation line in the Tumen border area that separates China and North Korea, seen in the distance, October 2008. While this bridge often facilitates trade, it is also used as a channel to return refugees caught in China. 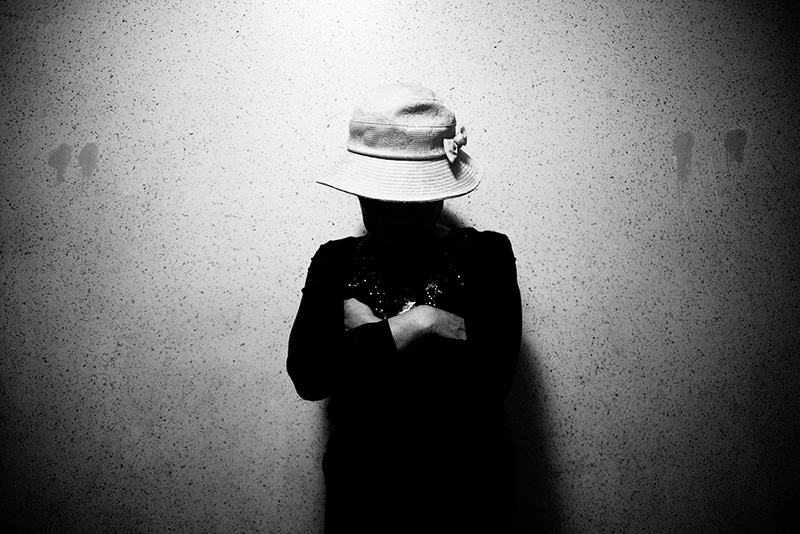 An activist guards her identity because she has dedicated her life to helping North Koreans make safe passage from North Korea to South Korea by way of mainland China, October 2003. She has been imprisoned twice and beaten by North Korean agents operating in China. 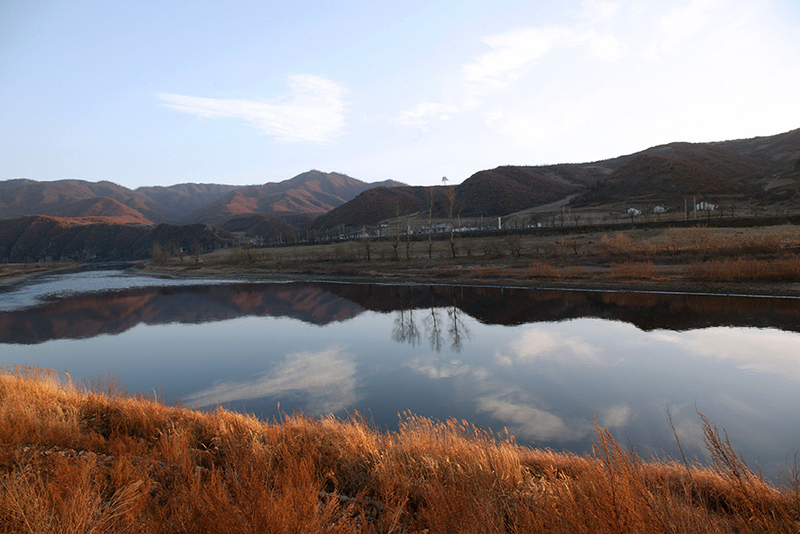 The Tumen River forms a natural border between North Korea, seen across the water, and China, October 2008. This nine-year-old North Korean boy, who was smuggled into China and hopes to follow his parents to South Korea, was raised by his grandparents in North Korea. October 2007. 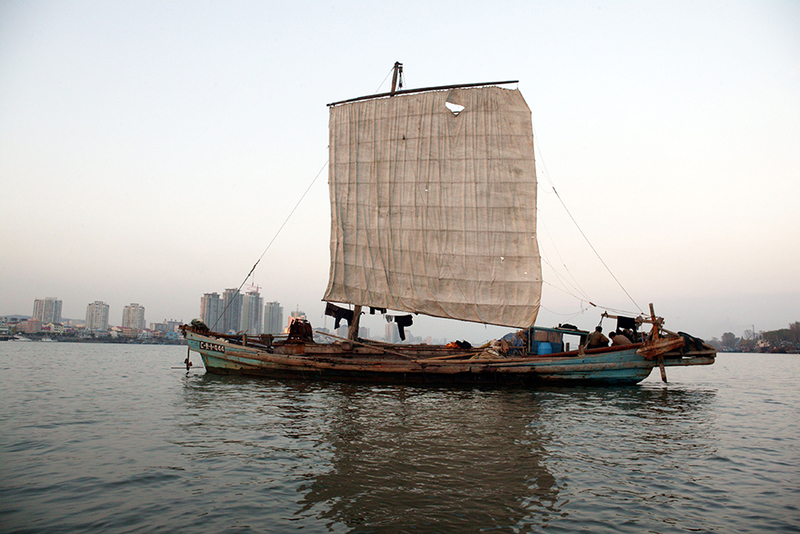 North Korean fishermen hang their laundry on a boat in the Yalu River between Dandong, China and Sinuiju, North Korea, October 2006. This seventy-two-year-old North Korean woman arrived in China in February 2007. She decided to leave North Korea when neighbors who had traveled to China secretly told her that people in China don't starve as they do in North Korea. November 2007. The Tumen River marks the border between North Korea and China. Many of the refugees who cross it wait until the winter months when freezing temperatures make for easier passage. October 2007. 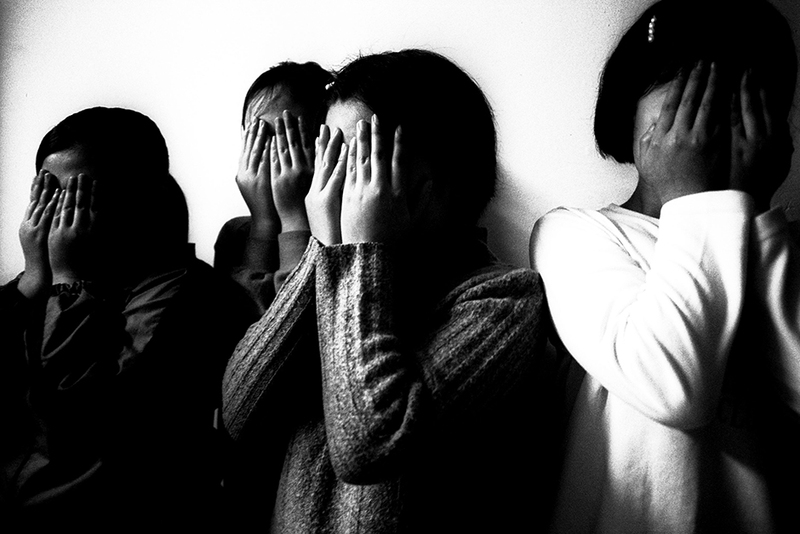 Four North Korean teenage girls, who fled their native country in 2001, hide their identities in a farmhouse near the North Korean border, January 2003. 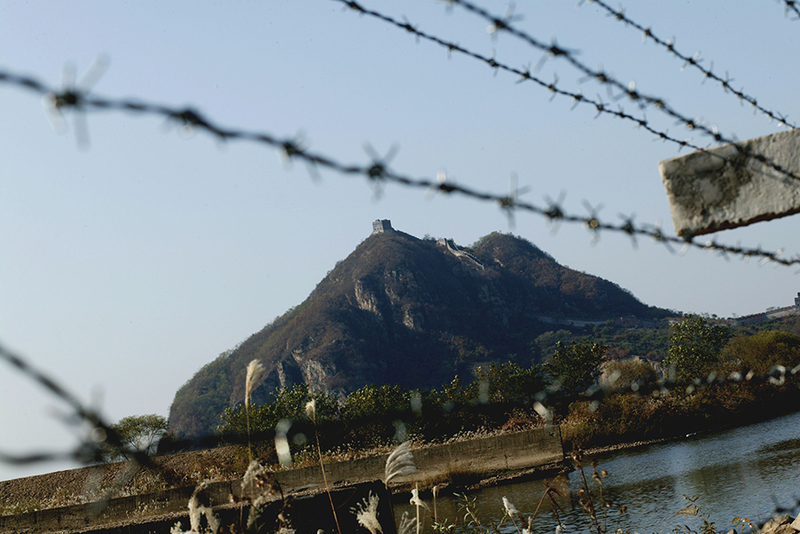 A mountain in North Korea is seen through a fence constructed in 2006 that marks the North Korea-China border, October 2006. 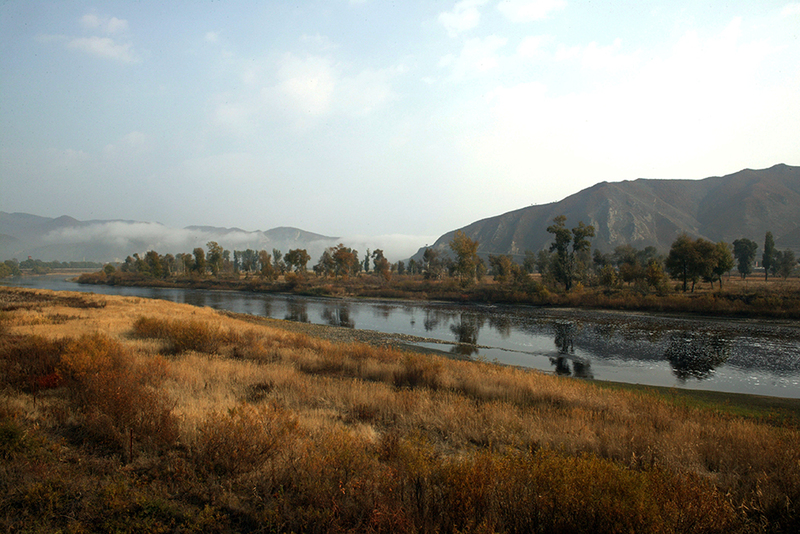 In some places, the border is a small creek where tourists and North Koreans can meet unofficially. A North Korean refugee covers her face to protect her identity in a farmhouse near the North Korean border, October 2003. 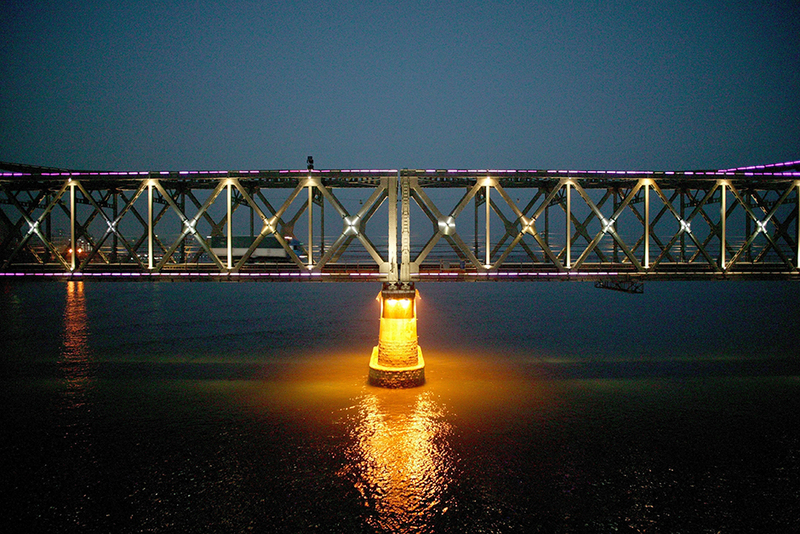 A truck crosses the Friendship Bridge that connects the city of Dandong, China and the city of Sinuiju, North Korea, October 2008. The bridge, like other channels that connect China and North Korea, also is used as a means to repatriate North Korean refugees caught in China. 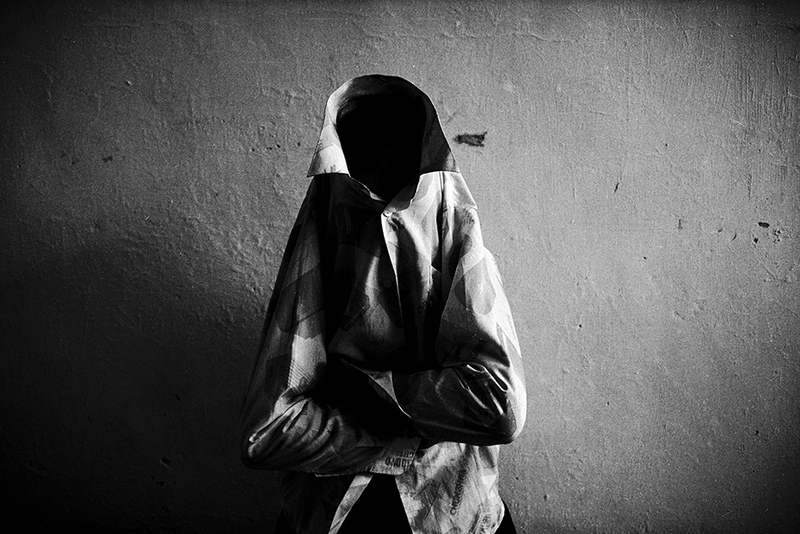 This refugee wraps a scarf around her head to keep her identity hidden, November 2007. To reach the Chinese border safely she waded through neck-high icy waters. 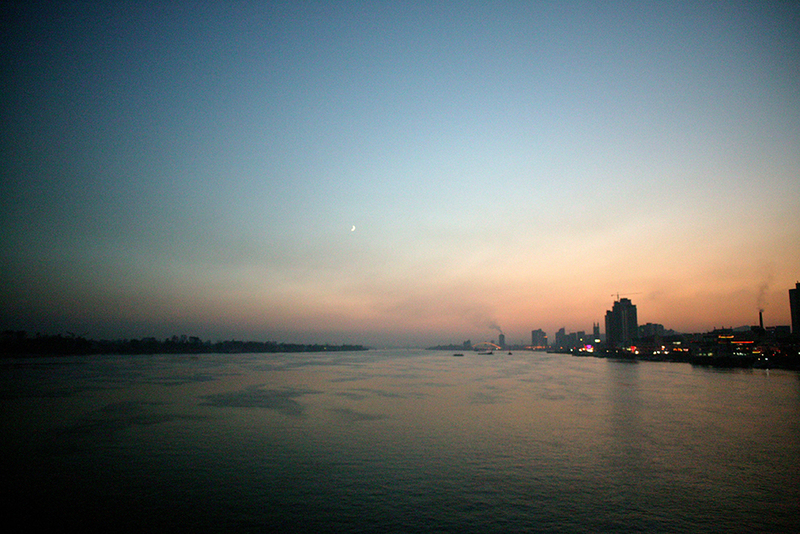 Night descends over Dandong, China, seen at right along the bank of the Yalu river, October 2006. This sixty-seven-year-old woman stands in the hallway of a building that is home to North Korean refugees living in Seoul, South Korea, November 2008. 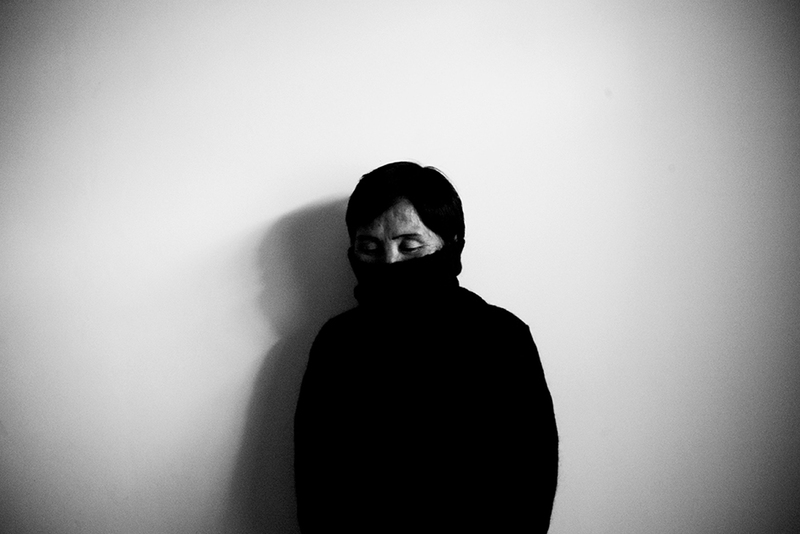 Nine years ago, photographer Katharina Hesse began to make portraits of North Korean defectors. 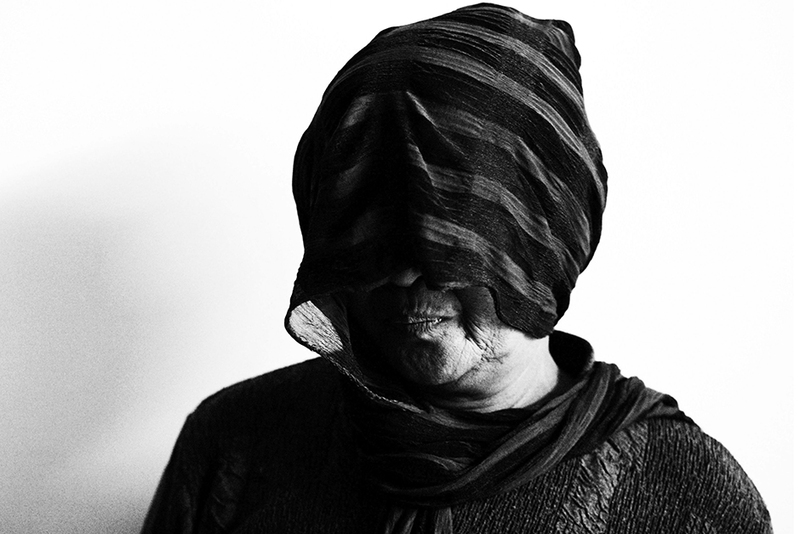 To protect their identities, she allows them to conceal their faces, asking only that they “give something” of themselves to the photographs. And they do. 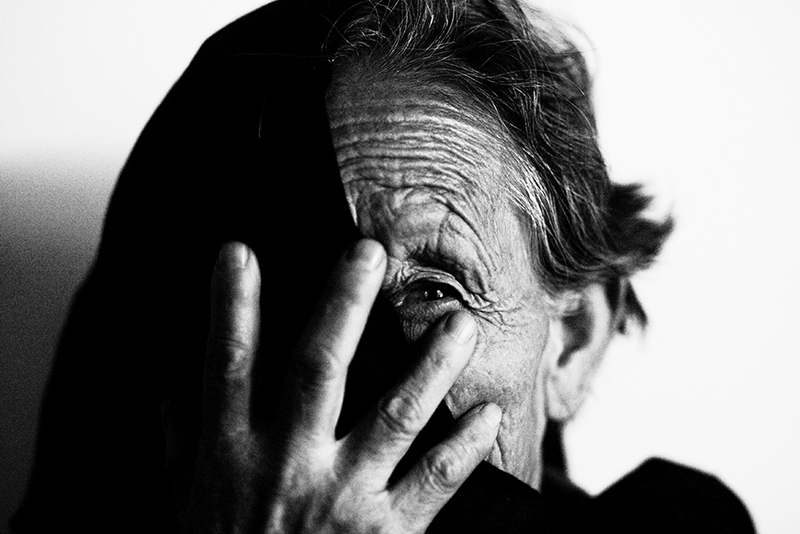 Her subjects bury their faces in their hands, or tuck them beneath the collar of a shirt, but even so, they work with Hesse to make themselves seen. Hesse pairs the portraits with images of the exposed, open terrain the defectors must traverse to cross the border into China and of the brightly lit bridges over the Yalu River that will carry them straight back to North Korea if they are caught. The landscapes work together with the portraits to build a sense of how difficult it must be for Hesse’s subjects to remain undetected, and of the terror they must feel at being forced to hide in plain view.